Among the highlights of my 2016 was an opportunity to return as a senior international judge for the Air New Zealand Wine Awards in Auckland. 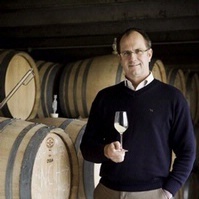 Judging this competition in 1999 was one of the most illuminating early experiences in my work in wine, one that disclosed a breadth of excellence and potential that was simply impossible to appreciate fully based on the relatively limited selection of New Zealand wines available for tasting in the USA. Equally illuminating in 1999 was the professionalism of the judges and the judging, and the caliber of the Awards in 2016 was even more impressive in 2016 under the direction of Michael Brajkovich MW, the Chair of Judges. I first encountered this glass two years ago when tasting in southern France, and it was pretty clearly the most arresting vessel I’d ever been handed for sampling a wine. It is beautiful to behold and even more amazing to handle, as it seems almost weightless. Moreover, the balance from the base to the top of the bowl is so perfect that, when loaded with an appropriately-sized pour and swirled, it produces an uncanny sensory impression that the only weight in one’s hand is derived from the rotation of the wine itself. That worked well enough for about 18 months, but then I sat in on a seminar on Austrian Pinot Blancs in Vienna last summer, and 8 of the damned things had me surrounded. Noted writer David Schildknecht, who conducted the seminar, felt the need to tell the attendees (all journalists) not to walk off with the glasses afterward. Had he not done so, I’ve no doubt that the count would have been diminished significantly. That’s how striking this glass is. Anyway, I finally sprung for a couple of them last fall, with the result that I’ve now officially fallen out of love with every other glass that I own…and I own a lot of them. To be clear, this looks like total mumbo-jumbo to me, and I don’t put a dime’s worth of stock into the business about cosmic parallels. But with that noted, the design of the glass is undeniably marvelous. As for the word “Universal” in the name of the glass, that apparently refers not to the cosmos, but rather to its all-purpose design. Other glasses in the line include stems dedicated to Burgundy, Bordeaux, Sweet Wine, White Wine, Champagne, Digestifs, Beer and Water. Have I tried these types? Absolutely not. Why not? Because I need 8 more expensive obsessions like I need 8 holes in my head. As for expense, the best online prices hover around $60. Wine Enthusiast will personalize your glass with a single initial for an additional $20, but in my humble opinion, only a jackass would mar this beautiful object with a giant letter. 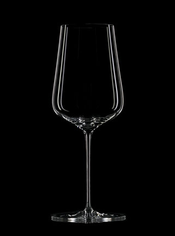 As for durability, Zalto’s website says the glasses, “…may be washed in a dishwasher,” but that seems like exceedingly bad advice. After all, dishwashers don’t break glasses; dishwasher loaders break glasses. Although the reservations I’ve expressed here about Zalto’s usage recommendations and cosmic design principles should make it clear that I haven’t quite drunk the cool-aid, I confess that I’m madly in love with this glass. Try one at your own risk!